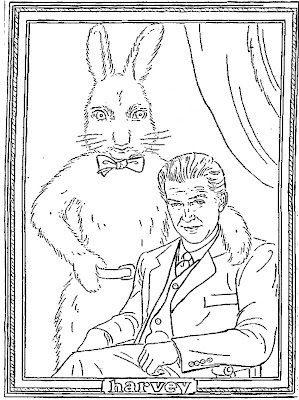 It is, of course, the wonderful Jimmy Stewart and his rabbit friend, Harvey. The newspaper movie coloring contest appeared in papers in 1951. Harvey starred Jimmy Stewart, Josephine Hull, Peggy Dow, Charles Drake, Cecil Kellaway, Victoria Horne, Jesse White, Wallace Ford and Ida Moore. Adapted from the Pulitzer Prize winning play by Mary Chase. Directed by Henry Koster. 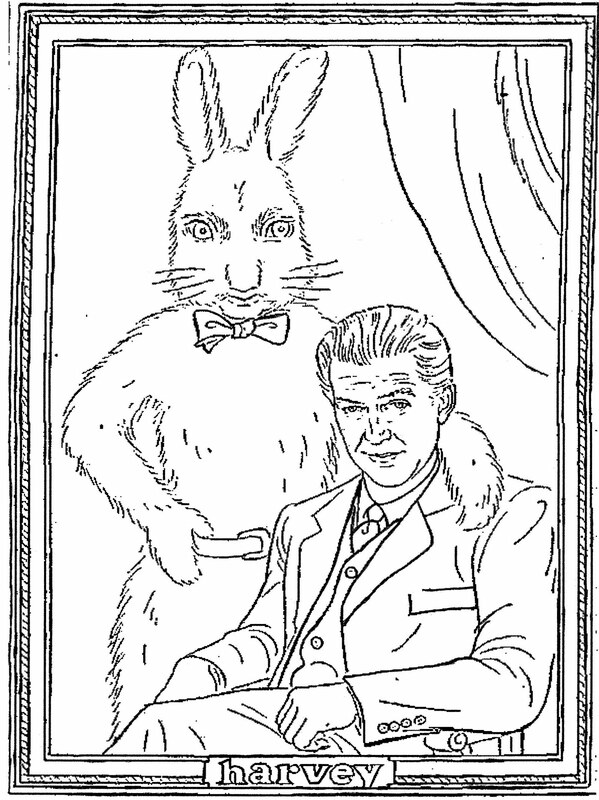 Comedy about a good natured fellow whose constant companion is a 6-foot tall invisible rabbit named Harvey. His sister is determined to marry her daughter off and decides to commit her brother to a mental hospital to get him out of the way. Due to a mix-up the sister is committed instead, and it is up to kindly brother and his imaginary friend to straighten things out. Hull won Oscar as distraught sister. When I was a teen, my mom and I went to see Jim Hutton in a stage production of Harvey. It was great fun. Harvey is a terrific movie and Jimmy Stewart is one of my favorite actors.